Who will buy our bonds? 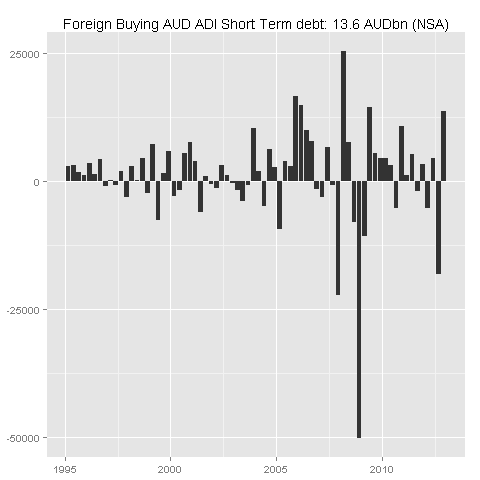 In retrospect, the peak in AUD buying for bond diversification was probably Q1’12: just about the time that it became a big news story. 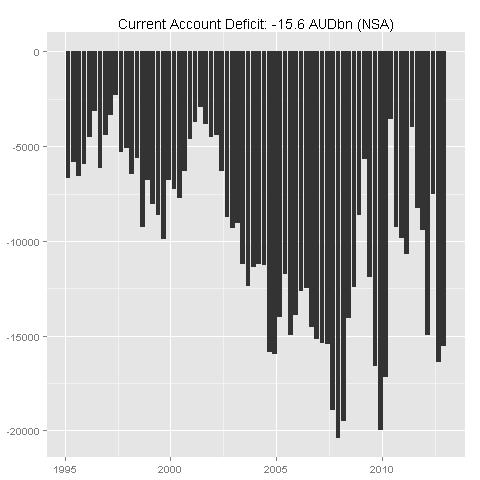 Anyhow, the Q4 Current Account deficit remained a healthy 15.6bn in Q4’12, and we know the accounts must balance, so how did it work this quarter? 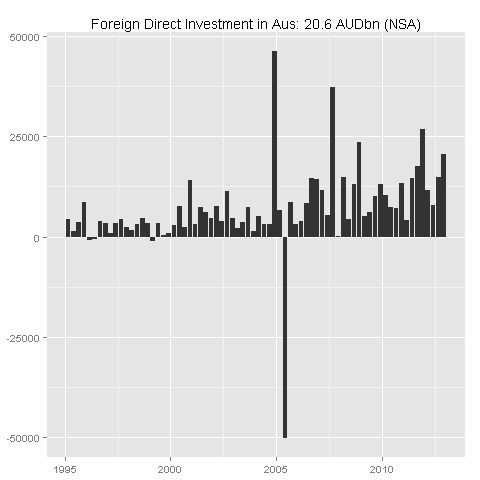 As has been the case for some time, foreign direct investment into Australia was very healthy: at ~21bn in Q4 (likely to be ~5.5% of GDP). This has been as high as ~7% of GDP in Dec-11, however we don’t often see numbers that are better than this. About 5% of GDP, or 20bn per qtr, is all we can expect. I guess that it is this inflow that held up the AUD in Q4 despite the weakness of commodity prices and RBA rate cuts – prompting premature claims of ‘safe-haven Australia’. As for the safe-haven, flows into Commonwealth Government Securities remained subdued. 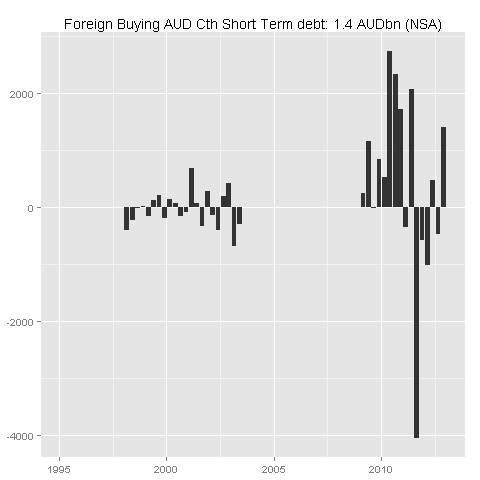 Flows into short-term debt (that’s treasury notes) was an okay 1.4bn — but then this has never been the market for foreign buyers. The long-term ACGB market (again) saw only tepid demand. The net inflow of 3.1bn in Q4 is on the smaller side of recent experience. Across the same period, the AOFM issued a net 5.8bn (face) of Bonds (nominals plus linkers). 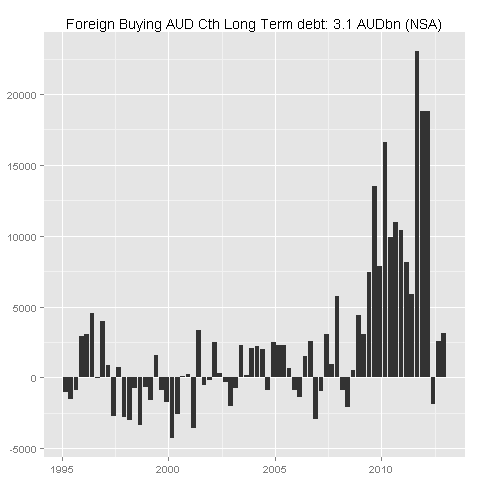 Over the prior two quarters, the AOFM has issued about 18bn of face (leading to a 16bn rise in the market value of debt outstanding as yields have increased) and the market value of net foreign buying has been 5.7bn, suggesting that foreigners are now taking about one-third of Australian bonds. The demand of Australian pension funds for sub cash bonds when term deposits are ~150bps over seems likely to be limited — which means that they may have to cheapen up a little to bring demand back toward (expected) supply. The traditional Australian way to fund a CAD is via sales of Australian Bank (ADI) bonds. This didn’t occur in Q4: there was a 7.5bn outflow (following a 15bn inflow in Q3). In part, this seems to reflect the buy-back of Australian government guaranteed bank bonds that were within 1yr of maturity. So if the bond flows have tapered, how have we made up the difference? With flows into short-term Australian bank liabilities … this inflow was ~14bn in Q4, a ~30bn change in the flow (Q3 was a heavy outflow). This is likely to be, at least in part, switching into short-term bank paper, out of government guaranteed bank bonds with only a short-term left until they mature. These accounts reveal that the funding of the current account has become a little more fragile (short-term bank inflows are less ‘sticky’ than long-term government bond inflows). In the near term, this is not a major issue. In the medium term, however, Australia’s claim to safe-haven status will be challenged if things do not improve. Safe-havens typically have current account surpluses, and capital outflows that slow when risk aversion rises (home country bias decreases as confidence rises). Australia never had this — we had strong direct investment flows and good demand for our bonds. 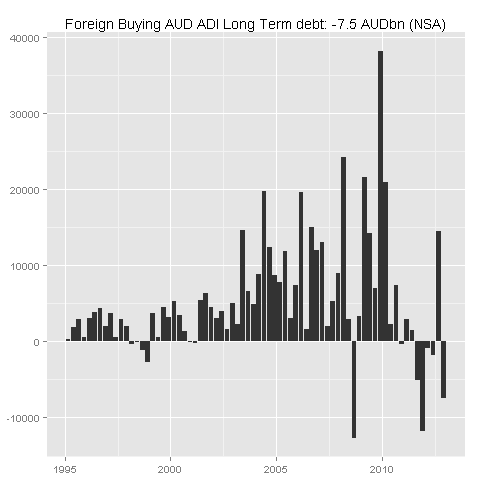 Australia still has good direct investment flows … but bond demand is waning. Selling 25bn per year of gross debt per year with yields 150bps below TD rates and foreign demand tapering seems like it might be challenging. Yields may have to rise or the AUD may have to fall to balance supply and demand. This entry was posted in AUD, economics and tagged Current Account. Bookmark the permalink. 1 Response to Who will buy our bonds? Thanks for that, as I don’t often get the time to check out the detail behind the current account.